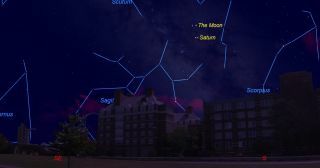 Low in the eastern sky in the hours before dawn on Monday, March 20, (the first day of northern Spring) the last quarter moon will sit 2.5 degrees above the ringed planet Saturn. With Saturn rising at 2:30 a.m. local time, the pair will be best viewed before 7 a.m. local time. If you have a telescope, you might want to consider setting your alarm on Monday (March 20) for around 5 a.m. local daylight time (4 a.m. standard time if you live in Hawaii, Arizona or Puerto Rico, which do not observe daylight time). If you step outside at that hour and look southeast, you'll see what are probably the two most popular celestial objects to look at through a telescope: Earth's moon and the planet Saturn. On Monday, which is the first day of spring in the Northern Hemisphere, the moon will be just hours away from officially arriving at its last quarter (or half-moon) phase. And hovering about 2 and a half degrees below the moon will be Saturn, the "Lord of the Rings." Over the years, people have told me that they own a telescope but have never viewed Saturn through it. The reason? Most beginners in astronomy have trouble making a positive identification of the planet. Indeed, to the unaided eye, there is nothing outstanding about Saturn. Venus and Jupiter can be identified by their great brilliance, and Mars has a distinctive fiery orange color. Saturn is indeed bright, but it does not seem to "stand out" against the star background. So what you'd really like to have is some sort of benchmark to know positively where it is. That benchmark on Monday morning will be the moon. And don't forget to check out the moon, too! Many people may say that the best time to look at our nearest neighbor is when it's at full phase, but that's probably the worst time to look at it! When the moon is full, it tends to be overly bright, as well as flat and one-dimensional in appearance. In contrast, the several-day interval when the moon is around first- or last-quarter phase is when we get the best views of the lunar landscape right along the sunrise-sunset line, or terminator. Some people may question why we call the moon at this particular phase a "quarter moon," considering it is plainly obvious that what we see in the sky is a half-illuminated moon. The "quarter" in "quarter moon" refers not to what we see in the sky, but rather to the fact that the moon is beginning its final quarter in its 29.53-day cycle, known as a synodic month. The word "synodic" is derived from the ancient Greek word "sunodos," which means "meeting." During the new-moon phase, the moon "meets" the sun, and thus a synodic month begins at new moon — and the moon is entering the last quarter of that month at last-quarter phase. If you do get outside with your telescope in the predawn hours Monday, I bet you'll be so fascinated by what you see that you'll stay outside almost until sunrise. And incidentally, the direct rays of the sun will cross the equator heading north at 6:29 a.m. EDT (1029 GMT), marking the vernal equinox, the start of spring in the Northern Hemisphere. What a great way to kick off a Monday! Editor's note: If you capture an amazing photo of the moon and Saturn, or any other night-sky view, and you'd like to share it, send images and comments to the Space.com team at spacephotos@space.com.